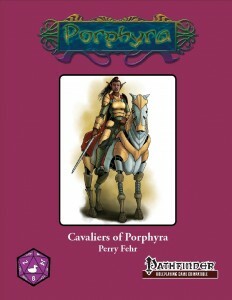 This installment of Purple Duck Games’ class-expansions tied into the Porphyra-setting clocks in at 12 pages, 1 page front cover, 1 page editorial/SRD, leaving us with 10 pages of content, so let’s take a look, shall we? Unlike quite a few cavalier orders presented in different supplements, the ones herein tend to sport quite compelling bits of fluff, but does the crunch stand up to this? Well, the first order would be the order of Murasakishi (aka Order of the Purple Stone) reduces the DR of targets they challenge by 1, +1 for every 4 levels. At 8th level, the class learns to expend either a challenge or use of resolve to roll all damage dice THRICE once during the minute following the expenditure of the resource. The choice can be made after the initial roll, while the level 15 ability nets you weapons that always count as porphyrite and count as in the most favorable condition when subject to e.g. the effects of water mastery and similar elemental mastery tricks. Okay, ONE glance should show you two things – a) this is intended for samurai as well as cavaliers. b) The order obviously has NO IDEA how the samurai works. The triple-damage trick is VERY powerful and paying for it with your challenge, arguably the most powerful resource of the cavalier, feels okay…but then the resolve-caveat hits. This nets the samurai +1/day use + 1 for every two levels, vastly expanding the amount of times per day the ability can be used. And yes, in my book, that is a significant issue. Beyond these, the wording of the abilities could have used tighter editorial control – while still working, they feel significantly less streamlined than they ought to. The order of regret (tied in with the avoodim-race), can extend the shared agony racial ability on targets without expending the daily uses – and know what? I like that idea! Sharing despair, additional AoOs of vengeance and the high-level ability to use AoOs to execute 1 attack per one that missed in the former round. Know what? Both the wording is more concise and I do like the mechanics here. Powerful, but interesting. The order of the mind for the naturally psionic qi’tar receive temporary power points upon issuing challenges and receive a limited array of psychic warrior powers. Oddly, the information on manifester level and power pool-size is in the skill-section, where is does NOT belong. Annoying/sloppy – the class invents its own ability-class: (Psi). This does not exist and should be Su, Ex, etc. – or better yet, adhere to Ultimate Psionic’s (Ps)-default. The order of the blood for the Dragonblooded – whenever these guys issue a challenge, they receive a “resist score” against the damage of a type of breath weapon the characters possesses. Alternatively, the cavalier receives a save-bonus. These guys receive racial bonus feats and are adept dragon hunters. The order of the crimson lance receives better defense while mounted in challenges. Interesting, but wonky in wording – the cavalier receives endure elements, but only until the cavalier takes damage equal to or above 1/2 cavalier class level. If it collapses, the ability resets after 12 hours. The ability is interesting, but the wording is pretty wobbly. High-level abilities include troop-inspiration and DR. There is also a fully-depicted quadruped radish-like polar, intelligent PLANT as a new type of mount – and they are odd and glorious. Kudos! Plant companions and full advancement stats are provided – before we’re introduced to Cavalier “Disorders.” Disorders are a variant of orders, with an emphasis of more choice – said choice, though is paid for by lost access to the tactician abilities. At 1st level, these guys universally receive 1/day reroll, +1 at 5th level and every 5 levels thereafter. The ability can also stand in for the tactician tree for the purpose of archetypal replacement…interesting! Three sample disorders are provided: Infinite, Perfect and Hoof. The infinite disorder contains even more rerolls or access to hero points etc. – and even a rod of wonder-like burst. The Erkunae Disorder of the Perfect, generally receives thematically fitting abilities for the fluff of the…but the wording. Urgh. At 15th level, the class is forced to expend all skills into an odd Profession skill to receive a cloud dragon mount – sans stats/mount-progression stats or proper ability interaction. The order of the hoof receives stampede, which, alas, is mostly useless for single medium creatures – especially since the cavalier, NOT his mount receives the ability. Later, summon abilities that can conjure forth the necessary creatures might help. We also receive 4 feats – one to wear horseshoes (all but required for aforementioned order, since it gets rid of the rider/mount-distinction), aid as an SP, getting rid of mount-death-downtime – okay, I guess. level 1 construct mounts, on the other hand – ouch and too strong in comparison. 4 new magic items, including horseshoes, increased leadership scores via helmets and a cursed banner – all pretty interesting. A type of surcoat that nets you the challenge of an order mmight be considered problematic for some. We also receive a sample level 1 character with a construct mount. Editing and formatting, on a formal level, are not bad. On a rules-level…well. Layout adheres to PDG’s printer-friendly 2-column standard with a nice full-color piece I did expect to find herein. The pdf comes fully bookmarked for your convenience. Perry Fehr, why do you do this to me? I am not engaging in hyperbole when I’m saying that I adore Perry’s ideas – he is a talented designer with an obviously brimming imagination. He also has a gift for iconic imagery and often, great ideas. I love the choice the disorders provide…but there’s no way past it – the crunch herein is almost universally non-standard in wording, rendering a lot of the abilities slightly more opaque than they ought to be. Now yes, the matter of fact remains that most still remain operable. They do deviate in various ways from how such abilities are expressed in other supplements, generating more ambiguities than necessary. While some abilities specify the caster level of SPs, others don’t – I could go on. I’d love to call it by any other name, but the pdf, at times, feels sloppy regarding the rules. You can get this inspired, but flawed supplement here on OBS and here on d20pfsrd.com’s shop.